Obesity; Pregnancy; Diabetes, Gestational; Hypertension, Pregnancy-Induced; Cesarean Section; Fetal Macrosomia; Abortion Rate; Glucose Tolerance Test. Objectives: The World Health Organization estimated that in 2011 worldwide 1.6 billion adults were overweight, and 400 million were obese. The obesity epidemic is a documented phenomenon and Oman is no exception. The aim of this study was to determine the effect of obesity on pregnancy and its prenatal and neonatal outcomes. Methods: A prospective cohort study was carried out among pregnant Omani women attending antenatal clinics in their first trimester in the Seeb province of Muscat, Oman. Results: A total of 700 pregnant women were enrolled in the study and were categorized according to their body mass index: 245 (35%) were normal weight, 217 (31%) were overweight, and 238 (34%) were obese. The relative risk (RR) of cesarean section among obese women compared to women of normal weight was 2.1 (95% confidence interval (CI) 1.2–3.2) and of overweight women was 1.4 (95% CI 0.9–2.3). The risk of elective cesarean section increased to 7.5 (95% CI 1.7–32.8) in obese women and was statistically significant in the obese group. In this study, 100 women (15.7%) developed gestational diabetes (11.8% of normal weight women, 17.8% of overweight women, and 17.9% of obese women). Miscarriages were more common among obese women 11.9% (n = 27) compared to the normal weight and overweight groups (6.7% and 9.4%, respectively). There was a weak yet statistically significant correlation between birth weight and body mass index. The risk of macrosomia was significantly higher in obese women compared to normal weight women. To evaluate the sensitivity of the oral glucose challenge test (OGCT), the oral glucose tolerance test (OGTT) was measured in 203 participants (29%) who had a normal OGCT result. It was found that 14.5% of overweight women and 13.5% of normal weight women had an abnormal OGTT result even when their OGCT result was normal. Conclusions: Obesity is associated with an increased risk of cesarean section (especially elective cesarean), gestational hypertension, macrosomia, and miscarriage. It also increases the risk of gestational diabetes. In 2011, the World Health Organization (WHO) estimated that 1.6 billion adults were overweight, and 400 million were obese.1 It is known that obesity increases the risk of many chronic medical conditions. There are no scientific publications regarding the impact of obesity on pregnancy and its outcome in Oman. Unfortunately, to date, obesity is not one of the listed risk factors for pregnancy complications in the Ministry of Health (MOH) antenatal and postnatal guidelines. The province Seeb is part of the Muscat governorate and contains eight primary health care centers. These deliver services to more than 89,000 women for 40,987 households (according to 2010 census, Ministry of National Economy).10 Our study is unique because it is the first prospective cohort study in Oman addressing the issue of obesity in pregnancy. Our study sought to examine the effect of obesity and adverse maternal and neonatal outcomes in pregnant women in the Muscat region by estimating the risk of cesarean sections (elective and emergency), gestational diabetes, and gestational hypertension and comparing the neonatal outcome between obese and non-obese mothers. We anticipate that the results of this study will contribute to a review of policy and guidelines for antenatal care where obese women will be considered a high-risk group during their antenatal visits. Figure 1: Recruitment of the study population. Women were grouped according to their body mass index. This prospective, cohort study took place in all primary health care centers in the Seeb province of Muscat, Oman, between March 2011 and April 2012. The target population was pregnant Omani women who presented to the primary health care center during their first trimester. Women who agreed to participate gave their informed consent to be followed-up throughout their pregnancy. Recruitment was done consecutively using a screening log until the required sample size was obtained using predefined inclusion and exclusion criteria [Figure 1]. The gestational age was either taken from the first day of the last menstrual period or estimated by early ultrasound scans (before 12 weeks gestation). Patients were excluded if they had a previous history of chronic diabetes or hypertension before pregnancy or the diagnoses of diabetes or hypertension in the first trimester of the current pregnancy. Pregnant women who presented after 12 weeks of gestation were also excluded from the study. Patients with any previous lower segment cesarean section (LSCS) were included in the study; however, they were excluded when analyzing the outcomes of emergency and elective LSCS. Study ethical approval was obtained from the MOH, Muscat Governorate. Data collection was done in three phases. In the first phase, between March and June 2011, 700 pregnant women were recruited from all eight health centers. The second phase of data collection was during their follow-up visits at 22 to 24, 28 to 32, and 36 weeks of gestation. The third and last phase was the collection of delivery details and postnatal follow-up checks, which lasted up to April 2012. Data was collected through interviews or by retrieving information from the Al-Shifa computer system (the National Electronic Health Record software). Delivery information was obtained during postnatal visits using the patients’ antenatal/postnatal cards or hospital discharge summary, at two- or six- week postnatal visits to the health center, or by retrieving information from the Al-Shifa computer system. Ethical approval was taken from the Royal Hospital for data collection and telephone communication with the patients. Gestational diabetes was diagnosed according to the Oman MOH pregnancy and childbirth management guidelines.11 All women were exposed to an oral glucose challenge test (OGCT) between 22 and 24 weeks of gestation using monohydrous glucose (50 g). If the blood sugar result after one hour was ≥7.8 mmol/L the women were recommended an oral glucose tolerance test (OGTT). Before the OGTT, women had to fast for eight hours. The fasting value of blood sugar was taken (up to 5.6 mmol/L is normal), then 75 g of monohydrous glucose was given, and blood sugar was rechecked after two hours. If blood sugar ≥7.8 mmol/L, the patient was diagnosed with gestational diabetes. As per the National Institute for Health and Care Excellence (NICE) guidelines for hypertension in pregnancy 2010,12 if two blood pressure readings taken four hours apart were above 140/90 mmHg after 20 weeks of gestation patients were considered to have gestational hypertension. Women were placed into one of three groups according to their BMI: normal weight (18.5–24.9), overweight (25–29.9), and obese (≥30). The women’s weight taken up to 12 weeks of gestation was considered her weight before pregnancy. Women with normal weight were considered the control group, and overweight and obese women were considered the exposure groups. To examine the sensitivity of the OGCT in detecting gestational diabetes, women who had normal OGCT results were offered the OGTT, and the proportion of gestational diabetes detected with each test were compared. Data analysis was done using SPSS Statistics (SPSS Inc., Chicago, US) version 16. Relative risks (RR) with 95% confidence intervals (CI) were presented for each of the outcome variables. Table 2: Maternal and fetal outcomes. *There were no hypertension pregnancy cases in the normal weight women (control group) resulting in the relative risk (RR) calculations giving wide confidence intervals (CI). Not much meaning can be made from this data and it has been excluded from the table. Table 1: Maternal sociodemographic and anthropometric characteristics. *Data presented as mean±SD. SD: Standard deviation. (n = 209) had a college degree, 14.5% (n = 96) had a primary education, and 3.2% (n = 21) were illiterate. More college-educated women fell into the normal weight group than the other two groups [Table 1]. (p = 0.001). Compared to the normal weight group, the obese group was at an increased risk of assisted vaginal delivery, miscarriages, gestational hypertension, macrosomia, and postdate delivery. No women in the normal weight group had gestational hypertension [Table 2]. Table 3: Sensitivity of normal oral glucose challenge test (OGCT) result in missing the diagnosis of gestational diabetes. Macrosomia is the term used to describe a very large fetus or neonate. However, there is no precise definition of macrosomia on which all obstetricians and researchers agree, and there is no national reference. The WHO defined macrosomia following a global study on maternal and perinatal health as a fetal birth weight ≥4 kg.13 In the obese group, 6.1% of women had macrosomic infants compared to 2.1% of women in the normal weight group. However, this difference was not statistically significant. Furthermore, this study showed obesity was not associated with an increased risk of pre-term delivery, episiotomy, vaginal tear, or low birth weight. Both OGCT and OGTT were performed for a sample group who had a normal OGCT result to evaluate the sensitivity of the OGCT result. It was found that 14.5% (9 of 62) women in the overweight and 13.5% (10 of 74) women in the of normal weight group had abnormal OGTT results despite their OGCT results being normal [Table 3]. Gestational diabetes was more common in overweight and obese women. In our study, the percentage of diabetes was higher in overweight women, which could be because diabetic women were excluded from the study at the time of recruitment and had a higher proportion of obesity. None of the women in the normal weight group developed gestational hypertension while 1.5% and 5.7% developed hypertension in the overweight (RR 8.1, 95% CI 0.4–155) and obese (RR 27.2, 95% CI 1.6–457) groups, respectively. Several observational studies have shown that the risk of pre-eclampsia is higher in obese women compared to overweight and normal weight women.16–18 However, we could not find any studies with the same result as ours to support the idea of the protective effect of normal weight in the prevention of gestational hypertension. Furthermore, we also observed that multigravida women were more obese compared to primigravida women. This might be because most women do not go back to their pre-pregnancy weight, which might result in a higher weight in subsequent pregnancies. From the total sample of 700 women, we were able to analyze 203 (29%) cases that had normal OGCT to examine the sensitivity of OGCT in detecting gestational diabetes. We found that 14.5% of overweight women and 13.5% of obese women missed the diagnoses of gestational diabetes as set by the current antenatal guidelines. We found no studies that tested the sensitivity of OGCT in diagnosing gestational diabetes by comparing to the OGTT. Our study was limited to one geographical area of Muscat Governorate, which has a large, urbanized Omani population. Therefore, the results, when compared to other regions of Oman, have to be viewed in this context. Some pregnant women were not willing to participate in our study due to increased waiting time in the health center. However, we are unable to judge whether this would have affected the results of the study. Finally, because some women in the Omani community travel to their parents’ villages after delivery, we had difficulties in retrieving their delivery information. However, since the tertiary care services are focused in Muscat Governorate, we can safely assume that the probability of adverse outcomes could be less in these missed cases. Based on the results of our study, we have some recommendations. Women with a BMI >30 are at risk of prenatal and intrapartum morbidity, and MOH guidelines should recognize these women as a high-risk group. We would also suggest that physicians consider OGTT as a screening tool for gestational diabetes in obese pregnant women at their first antenatal visit and if results are normal that the test is repeated between weeks 24 and 28. Additionally, a larger study should be conducted to examine the sensitivity and specificity of the OGCT and OGTT in obese women. BMI >30. Therefore, growth scans for such groups are recommended to enhance the antenatal care for obese pregnant women and improve maternal and fetal outcomes. A program should also be developed to assess the weight of women after delivery and to counsel them about a healthy lifestyle. Even with adequate prenatal care, obesity is associated with increased adverse effects on pregnancy and its outcome. We observed an increased risk of cesarean section (especially elective), macrosomia, gestational hypertension, and miscarriage. We recommend that all physicians perform OGTT for all obese and overweight women to screen for gestational diabetes. 1. Obesity and overweight. From http://www.who.int/mediacentre/factsheets/fs311/en/. Accessed January 2012. 2. Colagiuri S, Lee CM, Colagiuri R, Magliano D, Shaw JE, Zimmet PZ, et al. The cost of overweight and obesity in Australia. Med J Aust 2010 Mar;192(5):260–264. 3. Anis AH, Zhang W, Bansback N, Guh DP, Amarsi Z, Birmingham CL. Obesity and overweight in Canada: an updated cost-of-illness study. Obes Rev 2010 Jan;11(1):31–40. Published online 21 Apr 2009. 4. Allender S, Rayner M. The burden of overweight and obesity-related ill health in the UK. Obes Rev 2007 Sep;8(5):467–73. 5. Al-Lawati JA, Jousilahti PJ. Prevalence and 10–year secular trend of obesity in Oman. Saudi Med J 2004 Mar;25(3):346–351. 6. Sebire NJ, Jolly M, Harris JP, Wadsworth J, Joffe M, Beard RW, et al. Maternal obesity and pregnancy outcome: a study of 287,213 pregnancies in London. Int J Obes Relat Metab Disord 2001 Aug;25(8):1175–1182. 7. Seligman LC, Duncan BB, Branchtein L, Gaio DS, Mengue SS, Schmidt MI. Obesity and gestational weight gain: cesarean delivery and labor complications. Rev Saude Publica 2006 Jun;40(3):457–465. 8. Crane JM, White J, Murphy P, Burrage L, Hutchens D. The effect of gestational weight gain by body mass index on maternal and neonatal outcomes. J Obstet Gynaecol Can 2009 Jan;31(1):28–35. 9. El-Gilany AH, Hammad S. Body mass index and obstetric outcomes in pregnant in Saudi Arabia: a prospective cohort study. Ann Saudi Med 2010 Sep-Oct;30(5):376–380. 10. National center for statistic and information (NCSI). 2012, census date 2010 by localities, Sultanate of Oman. 11. Department of family and community medicine. Ministry of Health, Sultanate of Oman. Pregnancy and childbirth management guidelines, A guide for nurse, midwives and doctors. 1st edition. 2010. 12. NICE clinical guideline 107. The management of hypertensive disorders during pregnancy. August 2010. 13. Koyanagi A, Zhang J, Dagvadorj A, Hirayama F, Shibuya K, SouzaJP, et al. Macrosomia in 23 developing countries: an analysis of a multicountry, facility-based, cross-sectional survey Global survey on maternal and perinatal health. Published Online. January 4, 2013 Available at http://www.thelancet.com/journals/lancet/article/PIIS0140–6736(12)61605–5/abstract. Accessed January 2013. 14. Poobalan AS, Aucott LS, Gurung T, Smith WC, Bhattacharya S. Obesity as an independent risk factor for elective and emergency caesarean delivery in nulliparous women–systematic review and meta-analysis of cohort studies. Obes Rev 2009 Jan;10(1):28–35. 15. Seligman LC, Duncan BB, Branchtein L, Gaio DS, Mengue SS, Schmidt MI. Obesity and gestational weight gain: cesarean delivery and labor complications. Rev Saude Publica 2006 Jun;40(3):457–465. 16. Athukorala C, Rumbold AR, Willson KJ, Crowther CA. 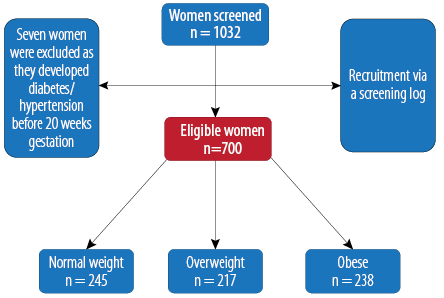 The risk of adverse pregnancy outcomes in women who are overweight or obese. BMC Pregnancy Childbirth 2010;10:56. 17. El-Chaar D, Finkelstein SA, Tu X, Fell DB, Gaudet L, Sylvain J, et al. The impact of increasing obesity class on obstetrical outcomes. J Obstet Gynaecol Can 2013 Mar;35(3):224–233. 18. Gaillard R, Steegers EA, Hofman A, Jaddoe VW. Associations of maternal obesity with blood pressure and the risks of gestational hypertensive disorders. The Generation R Study. J Hypertens 2011 May;29(5):937–944. 19. Metwally M, Ong KJ, Ledger WL, Li TC. Does high body mass index increase the risk of miscarriage after spontaneous and assisted conception? A meta-analysis of the evidence. Fertil Steril 2008 Sep;90(3):714–726. 20. Boots C, Stephenson MD. Does obesity increase the risk of miscarriage in spontaneous conception: a systematic review. Semin Reprod Med 2011 Nov;29(6):507–513. 21. Flick AA, Brookfield KF, de la Torre L, Tudela CM, Duthely L, González-Quintero VH. Excessive weight gain among obese women and pregnancy outcomes. Am J Perinatol 2010 Apr;27(4):333–338. 22. Crane JM, White J, Murphy P, Burrage L, Hutchens D. The effect of gestational weight gain by body mass index on maternal and neonatal outcomes. J Obstet Gynaecol Can 2009 Jan;31(1):28–35. 23. Kiel, Deborah W. Artal R, Boehmer TK, Leet, TL. Gestational Weight Gain and Pregnancy Outcomes in Obese Women: How Much Is Enough? Obstet Gynecol 2007 Oct;110(4):752–758. 24. Institute of Medicine of the national academies, Weight gain during pregnancy: reexamining the guideline: institute of medicine 2009. 25. The American College of Obstetrician and Gynecologist, committee opinion, Number 549, January 2013.